General Lamps Blog - The smart home revolution is here but are we ready? Smart home technology is yet to reach the point where people widely understand its potential benefits. The majority of us, myself included, have only been subjected to gimmicky gadgets that provide more novelty than practical use but this is slowly changing. The vision of what living in a smart home enables us to do is becoming clearer. Smart controls for heating, lighting and security allow us to live safer, greener and more convenient lifestyles. And these are all available now. Recently we went to a demonstration of Lightwave RF, a company that have developed a series of switches, relays and sensors that can be controlled through your smart phone or a remote control. By replacing your existing light switches, power sockets and radiator valves with the Lightwave RF equivalent they can then be used to control everyday objects around your home. Without having seen this demo first hand it would be difficult to understand the creative opportunities they bring. The functionality of the app allows you to programme timers and events, group or lock any of the switches in your house. 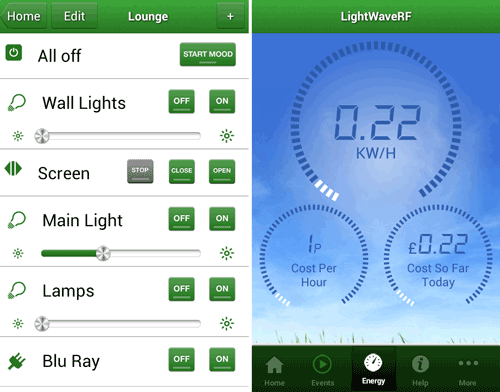 This is by no means the only solution available, big players like Google and Apple are creating their own product ranges but for now I think Lightwave RF is the most complete and affordable solution to turn your house into a smart home.